A Monday Meme…Traveling the Metaverse… – Ce Soir Arts – Be inspired tonight! This week, the wonderful Strawberry Singh issued a Monday Meme that got my attention. (Her memes often do that…but this one is special because I get to delve into my LM folder, revisit some favourite sims – AND discover ones that are new to me). Thank you, Berry! This birdbath is near the landing point – to your right as you walk toward the Ce Soir Arts Gallery. I sometimes sit there for a bit and ponder. It’s peaceful and I sometimes get to greet visitors. I like that! In the above photo, you can see the main house. It’s set in a field of lavender, a small vineyard, and various little nooks that are surrounded by the sea. A meandering river flows throughout. This sweet spot is where Poet Laureate of Ce Soir Arts, Russell Eponym (and other poets) read the work of others as well as their own writing. 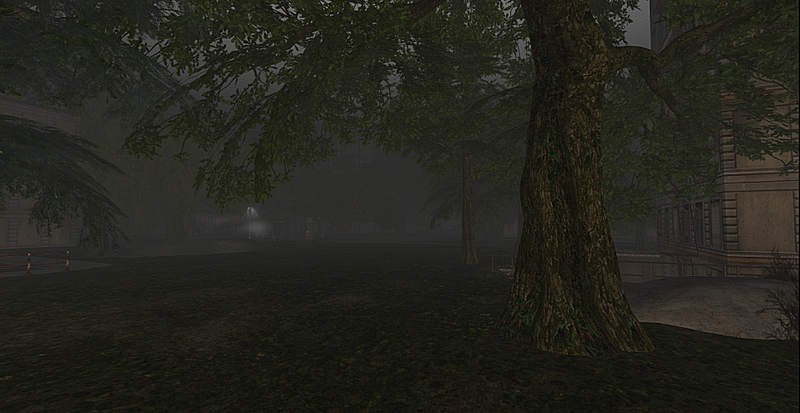 You must come hear Russell – every Tuesday at Noon SLT. It’s an uplifting and edifying delight you must experience. Classical and acoustic music, literature from across the genres, and a wonderful “Thought for the Day” keep us in rapt attention at The Magic Tree Reading Spot. Magical! I do love winter – all weather, actually. Rain lifts my spirits, snow clears my mind, sun warms my heart…and The Conservatory is a favourite part of Ce Soir Arts for me. Cozy nooks as well as a fine dancefloor make this spot unique and lovely. 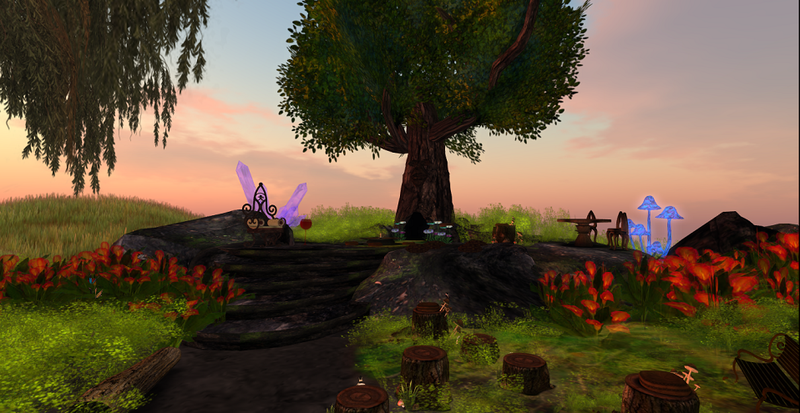 We hosted the SL Music Races for a Cure Art Faire & Auction here to benefit RFL of SL last April, and some of the best musicians (and poets) have performed here. It’s special indeed! 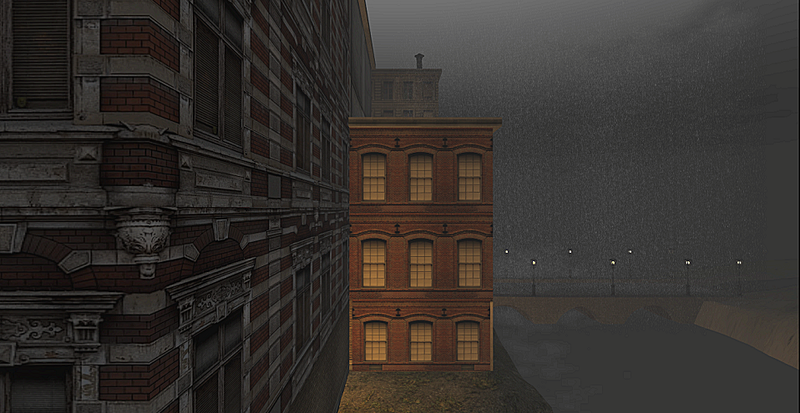 Mad City by MadPea Games is rainy and foggy. As previously mentioned, I love weather – especially inclement weather. Something about it draws me. Sometimes, when it rains, I pull in and spend hour reflecting or writing. Other times, I venture out – with or without umbrella or other protective gear. It’s invigorating and soothing at the same time. Ah! Contrasts! Fog is another of those weather elements that sparks my imagination. When it is really thick like pea soup and I can barely see my hand in front of my face, it’s a wee bit frightening. But when it’s like this (in the photo above), it just makes me feel safe – although there is a mysterious element that has a bit of thrill in it. Hmmm… Yes! 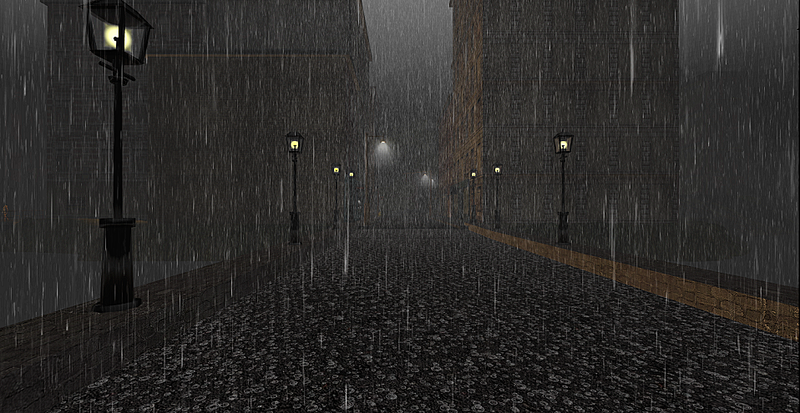 The City, bathed in rain, is still alive with business and people scurrying about. In this shot, just ahead await some shoppes and shoppers. The idea of rushing through the rain and arriving just inside the shoppe doors, drenched and shivering as the warmth of the shoppe welcomes me is very enticing. That’s just what happened here: a mad dash through the downpour to the warm hearth of the shoppe and the welcome of the merchant. Oh, and the shopping part too! I love how the lights play on the water here. The gently rocking boat, following the soothing waves as they come to shore. Here, you can see some of the beautiful semi-transparent roses that also grace Ce Soir Arts. I think they’re lovely in this view with the expanse of sea and the church ruins in the distance. Beauty amongst decay is an elegant contrast filled with meaning. Do visit WEG and see what I mean! Aeon is a professor and he adores literature, as do I. 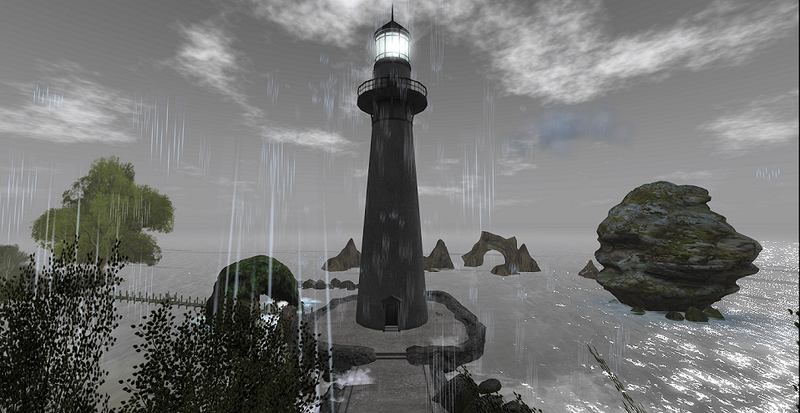 For some time, he has wanted to create a place where he can illustrate poems and stories as mini-environments in Second Life. Of course, I want to help him do that, and at some point, you’ll see some areas at Ce Soir Arts (or elsewhere!) where we have done some of this work. How happy we were to discover Empyreal Dreams by Ariel Wingtips and Remington Aries, as this is very well-done work to represent some of the finest literature ever written, and it’s a delight to visit. Take a look below and plan to go there! 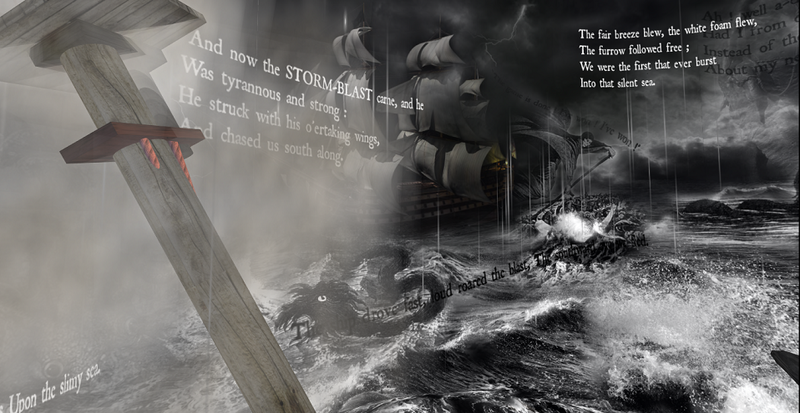 This depiction of Samuel Taylor Coleridge’s epic poem The Rime of the Ancient Mariner is so striking that I cannot imagine any other way to do it as effectively as this. The creators are to be commended for their vision and execution of this work. Go there and stand in those rushing waves and you’ll be taken by it too! 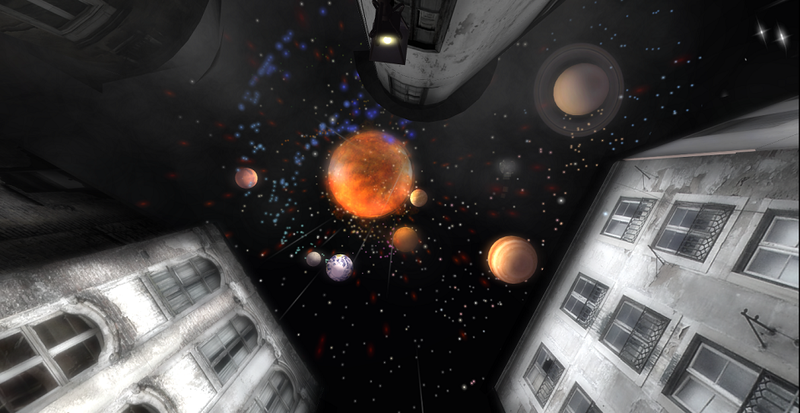 Empyreal Dreams – Les Miserables with Planetary Wonders! This is really something to see! Above the “set” for Les Misérables, fly the planets in orbit around the sun. There’s a starry wave of a staircase before a photograph of author Victor Hugo; walk up it and you’ll be in the midst of these planets – feeling very small and in awe. This is a delight! 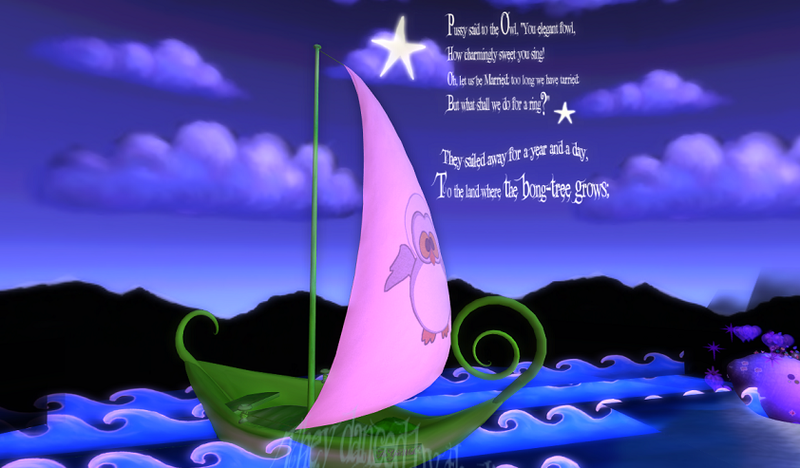 Surrounded by the tale of The Owl and the Pussycat by Edward Lear, I felt like I could just get into that boat and float away with them on a romantic adventure. It’s lovely, colourful, and FUN! Do go and enjoy! Some sims just inspire me – and there are so many that have come and gone that I just can’t forget. One is The Nameless Isle by Baron Grayson. I miss those dark agate beaches and that wonderful swirling water…the jungle-like forested areas…the little pools of refuge. Sadly, all my photos of that wonderful place are on another computer and it’s a continent away. I promise, I will share when I can, but I just had to mention it… And there are so many others such as Inis Caiseal from the team of Alchemy Immortalis – “the dream merchants,” two creators whose vision is simply beautiful. They do still have shoppes in-world and on Marketplace, but I miss Inis Caiseal too; it’s Celtic beauty will live on! I read of this sim – Winter Moon by Dream Shadowcry – in a post at Honour McMillan’s wonderful blog where you can learn more about many excellent places to visit in SecondLife. There was a machinima made to honour the memory of a lovely lady. 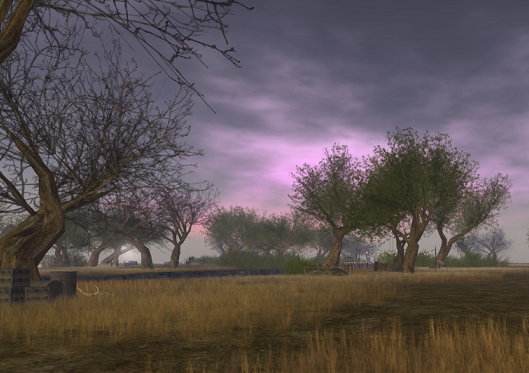 Do visit AND view this beautiful and touching machinima entitled “The Chromatic Diaries” by Anim8tor Cathy. Hazardous by Mandingo Quan took my breath away when I first landed after the fall (go visit and you’ll understand that). So much to see here, and the rock walls are incredible! Each scene is a treat, and the shoppe is called [we’re CLOSED]. You must visit to see their things. Well-done, to say the least! Whew! And that’s not all – as I am sure you can imagine. I’ve been working on this for three days now, and it’s more typing and computer work than I’ve done in going on six weeks now. I am tired, but what fun this has been for me! Thank you, Strawberry Singh! I love your Monday Memes, and this one was spectacular! Not only did I get to revisit some favourite spots and reminisce about some that are long gone, but also I learnt about many more wonderful places to visit! Pop on over to Strawberry’s blog and check this post for many intriguing links! Have a wonderful Wednesday evening…and Aeon and I will see you soon! Awwww, Ce Soir looks so beautiful. I’ll definitely pop by for a visit soon! You’ll be welcome, anytime! We’re still on vacation, but have a few shows going. A new exhibit will be in the gallery for September too.